FF&E specification is usually a tedious, clunky process — not only does it cut into your bottomline, it’s honestly annoying as well. That’s why we built Fohlio: Because we’re all about making life easier for designers and architects. If you’re not using it yet (watcha waitin’ for? ), Fohlio is a project management system for interior design and architecture projects. That’s what we initially designed it for, anyway. Currently, we also have users that are home stagers, set designers, boat builders, and more! Here are six reasons our users love us, and six ways Fohlio will make your FF&E specification process faster and easier. It’s easy to get lost in endless spreadsheets, and in the process, forget an item or two that you need. There’s a quick, efficient way of building lists that you can easily upgrade to a full-blown spec list. Just build your list of must-haves and options directly in Fohlio. You can do this using the Quick Entry feature. Let’s say you’re renovating a kitchen, and you already know that you’re getting an oven, a range hood, a dishwasher, tiles and all the other usual accoutrements. 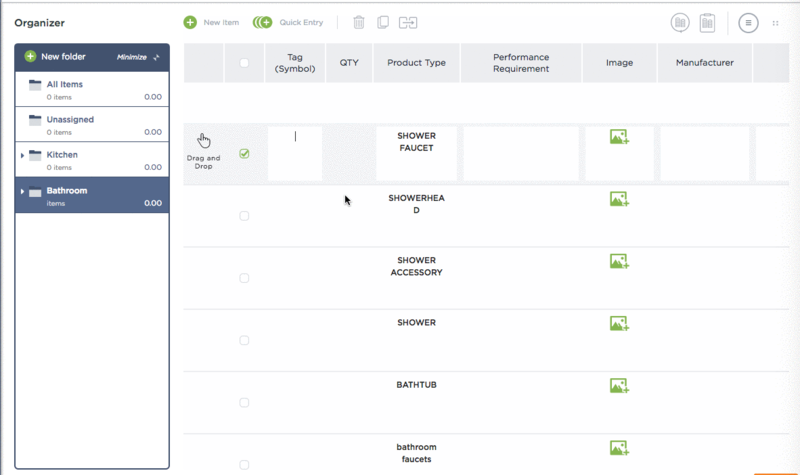 Click the Quick Entry button to quickly build a list without having to fill in the specifics, and add the products you need to specify (range, dishwasher, etc.). 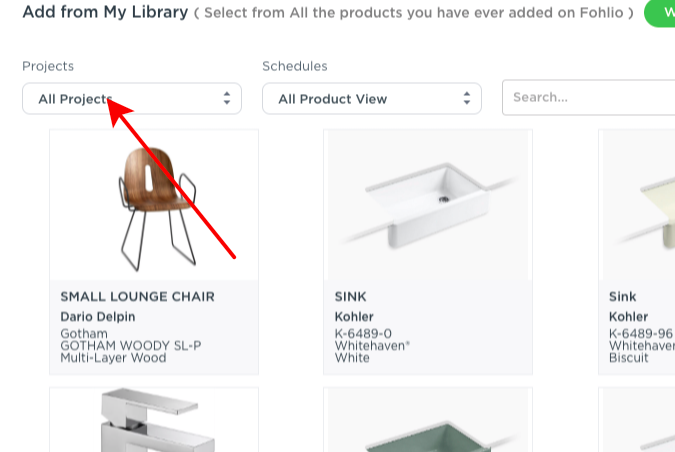 When you’re ready to start looking for products, just click the F+ button in the row of the item you’re starting with. Then, go to your favorite sourcing websites. When you find something you like, click the F+ shortcut in your browser’s menu bar, and the Fohlio web clipper will open up. You can then fill in the details of your product, like its name, image, color, price, etc. You’re essentially to “cross off” the items in your list. This feature is especially useful if you’ve been designing for a while. After a few projects, you know that some pieces are just tried and true. You don’t want to have to re-spec them or dig through past projects just to find the details again. That’s what the Library is for: We make it easy to reuse items and search for them. Just type in any keyword in the product’s specifications, and hit search. Then select the items you want and add them into your project. I used to find one-of-a-kind rugs I knew I just needed to put in someone’s home. If it didn’t work for one client, I just had to move it to another. In any case, I’d keep a mental checklist of all these rugs that I knew I’d want to use in the future. In Fohlio, that’s the equivalent of saving it in your General Bookmark project. While specifying for a project, you’ll sometimes come across a product that you just fall in love with, but you know won’t work for your current client. Just save it in General Bookmark. When the right match (a.k.a. client) comes along, just select a whole room of items, a group, or just a single item, and use the Move feature to add them to a current project. Many people, and especially designers, consider Pinterest to be their best friend, and for good reason. It’s a venerable treasure trove of ideas and inspiration, plus everything is so easy to save — what’s not to like? Let’s face it, though: Pinterest is hardly a complete solution because it doesn’t make FF&E specification any easier. So what do you do? You save your Pinterest boards to Fohlio, of course! Just click on Integrations on the bottom left of your screen and select the board(s) you want to import to Fohlio. Turning inspiration into real-life projects just became seamless. Want to put together a mood board quickly without having to bother with the specs just yet? You can! You know what’s even better? You can go back to these items to add details without having to start over. Just click on Mood Board, and start adding images using your imported Pinterest inspiration. You can also add images using the web clipper, and leave it at that (or, like we said, go back later and add details). This is a great way to create a mood board to present to your client, an images-only item list, or a concept image to guide your design. After client meetings, you’ll have a more concrete list for ff&e specification. You can then use the web clipper to update items with more product details. Similar to turning your to-get list into a spec list (see item 1 above), click the F+ icon in the row you want to add details to. This will take you to the product’s website page, which will then allow you to collect images, price, color, and more. I just had a client tell me they wanted to build an extension to an office I already did the design for. Because it’s already an existing project, all I have to do is copy my old project and re-use details that I know will work for my client. It has the same templates, products, folders — everything so you don’t have to start ff&e specification from scratch. Tweak it to make it something new, or an extension of an old project. Just go to Project Editor, select the project you want to make a copy of, and click Duplicate. Want a more detailed, one-on-one demo of everything Fohlio can do? Schedule one here — It’s free and we’d be happy to show you around.